Clay masks are my thang when it comes to pampering my skin. There's just something satisfying about that tight feeling and seeing the excess oil from my pores being drawn out and absorbed into the mask. Then there is the smell of the clay, I'd like to say it's a sweet fizzy scent... but that makes no sense at all, but it's definitely fresh and wonderful. 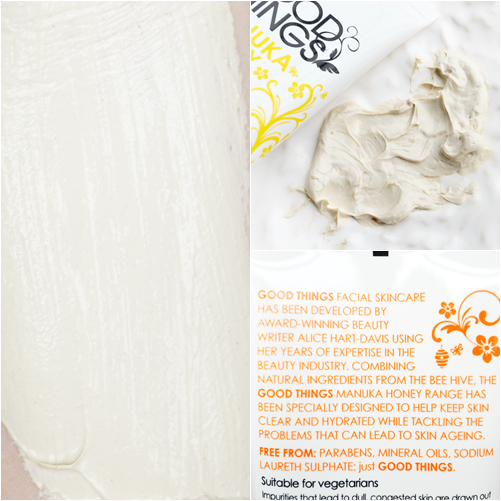 So when the fairly new Good Things Manuka Honey Face Mask (£5.99 - Boots here) came in to my life I was pretty excited. Excited because it's from Good Things - an affordable high street skincare brand I love AND my first ever White Clay mask... which is apparently good at stimulating circulation, drawing out impurities and can be used on sensitive skin. Like with all new skincare my first test is to sniff it and suss out if I like it. Which was a very simple task with this mask as oh my days... this is nearly the best smelling mask I've tried (after the Amie Deep Cleansing Clay Mask which smells like fresh lemonade)! The Manuka Honey is without a doubt the most present smell here but so subtle that it reminds me of honeysuckle - fresh and summery. Really just perfect for summer! As instructed on the tube I smoothed a thick layer of the mask over my face and sat back with the new issue of Woman & Home mag for 10 minutes. Side note/question - Does anyone else in their 20's read W&H? I'm very much over magazines that are all ads and no substance, so W&H and Red are now firm favs. Anyway, back to the mask... within 5 minutes the feeling of the mask had gone from creamy to dry and the typical tight clay mask feeling - the one in which you try your best not to laugh and wonder if you can sip your drink without moving a muscle in your face. I will admit this is the tighest clay mask I've tried which may be an issue for some but I quite like it. Once fully removed with warm water and a flannel (it would take forever with just your hands) my skin felt very fresh and clean, but also hydrated.. it had that plumped up feeling to it that just feels healthy. As for how my skin looked it was mainly pink from using a flannel but once that had died down my skin did look clearer, giving that brightening effect I was hoping for. So far I've used the mask over 5 times in the past 2 weeks and really can't get enough of the scent and the nice effect it gives to the skin. Definitely one if you have a dull complexion or oily/combination skin. 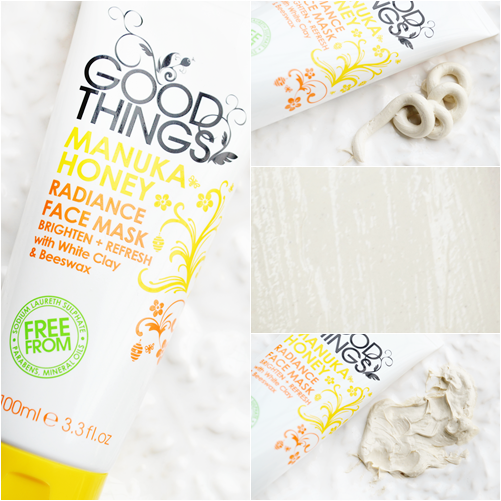 The new Good Things Manuka Honey range also consists of a creamy cleanser, refining scrub and daily moisturiser. Next on my list to try is the cleanser, though I have more than enough of them!